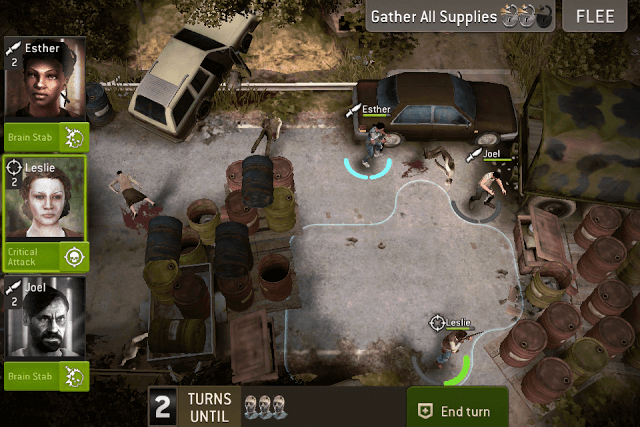 The Walking Dead: No Man’s Land is a turn-based tactical role-playing game developed by Next Games. The game’s battle system is similar to X-Com: Enemy Unknown. However, there are some new elements added to the combat system, making play time more fun and enjoyable. There’s also a camp to manage and upgrading key structures will help your team members survive the undead nightmare. You will also manage survivors, keep the best ones and retire those who may not be able to sustain zombie attacks. No Man’s Land and Road to Survival are two stunning turn-based RPG games available on the Play Store. But if you are into pure base-building game, such as Mobile Strike, then you should play March to War. No Man’s Land’s combat system is pretty solid and lets you devise your own tactics. Choosing the right survivor type, leveling up members and upgrading weapons and armor may help you eliminate the zombie menace faster. Here are some more tips and battle tactics that may help you take down walkers and get more loot. The game utilizes the Action Point (AP) system. APs are usually spent to move and to perform overwatch/direct attacks. To perform an “overwatch” attack, you will need to spend half of the total action points (AP) to move a survivor a short distance. When a walker gets close enough, the remaining action point(s) is spent in attacking a zombie. The survivor will automatically attack any threatening zombie near it. 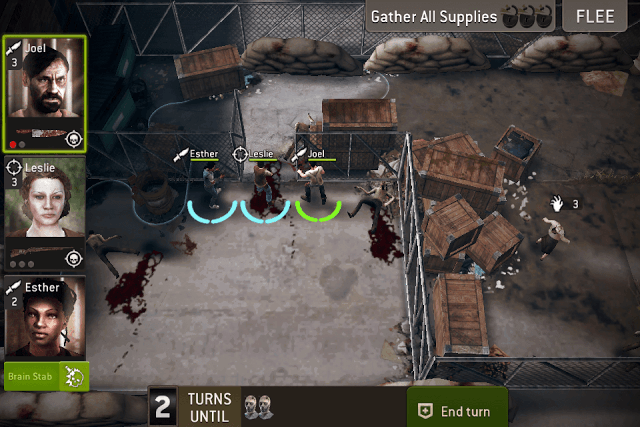 After moving survivors a short distance, tap on “End Turn” to let walkers come closer to your team. You can see how many action points are spent while dragging your finger to the desired spot. Make the most of each survivor’s “overwatch” ability when your team is placed behind crates, obstacles or a gate that allows only one zombie to enter. Position your survivors close to each other behind an obstacle or a gate to perform multiple overwatch attacks. Perform direct attacks when there are no obstacles and your survivors are surrounded by zombies (here the hunter class would be a good option to take down multiple zombies). Remember that a direct attack does more damage, and many times, kills a zombie instantly. Overwatch attack does less damage and so you will need to position your survivors close to each other so that they launch multiple attacks to a walker to eliminate it. Each survivor has a critical hit ability that gets activated when he or she takes down one or two zombies. For example, for scout survivors, the “Brain Stab” critical hit gets activated when they eliminate two walkers. Once the new ability gets activated, it will be shown in green. Tap on the “Brain Stab” button below the survivor profile pic on the left side of the screen. Next, drag the finger towards the zombie you want to kill. The survivor will deal a lethal blow to its head, killing it at once. The critical hit will also grant extra XP. Walkers advance in turns. So the first line of zombies will move closer to your team and the farthest will move behind them. Many times, they appear invisible until your team member moves forward. Make sure you perform direct attacks to eliminate the first line of zombies. You can then start killing the ones positioned behind them and so on. There will be more than one objective so keep on completing goals while eliminating any fast-approaching zombie. Keep an eye on your goals on the top right corner of the screen and head to the exit when the objective section says so. Remember that your goal is to complete objectives(s) and move all your survivors to the exit point before walkers start appearing again, not eliminating zombies unless a level tells you to do so. Zombies appear after the threat countdown reaches zero and appear in large numbers if you shoot a zombie as gunfire attracts more walkers. Instead of neutralizing a threat wave or additional zombies, look for the exit. A Hunter class survivor uses a sniper rifle to take down multiple enemies in one shot. 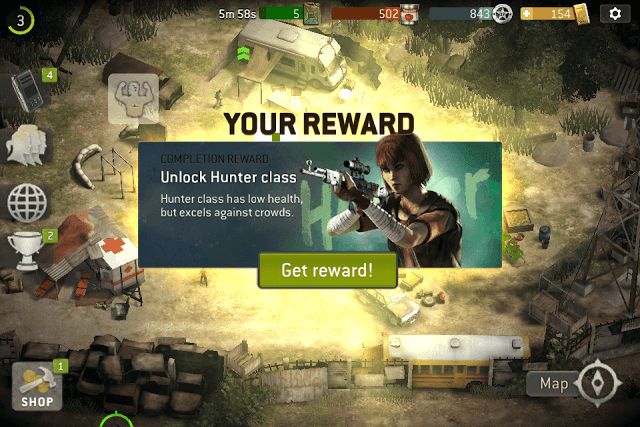 If you see walkers positioned in a straight line, one behind the other, then it’s the right time to make the most of the hunter class survivor’s shooting skill. One shot and it will take down all zombies standing in a row. However, there is one drawback – gunfire attracts more zombies and extra zombies will appear after a set number of turns are over. So make sure you complete objectives and head straight to the exit before they start attacking your survivor team. There are different types of walkers and their type can be seen above their head. You can also a number above a walker’s head. The number above shows the difficulty level. The higher the number, the more the difficulty level. It can be tough to eliminate some type of walkers and with a higher level up on their head, destroying them can be almost impossible unless you have a team consisting of higher-level fighters equipped with upgraded weapons/armor. Tap on a walker to know more about him and if you see a stronger type, try to avoid confrontation. You can stealthily move to a different direction or try to avoid moving towards the walker’s path. Common fast-approaching zombies can be easily taken down with knife stabs or a sniper rifle, but beware of armored zombies. Use melee attackers against armored walkers. You can easily identify an armored walker by tapping on it or from the armor it wears. Don’t use a hunter or shooter class against them. Even a melee unit will have to attack more than once to bring them down. Use critical hits like “Brain Stab” to deal massive damage in one blow. Shooters can be quite deadly when battling higher level ones. You can use them against armored zombies. Zombies are always on the prowl, trying to infiltrate your camp. Eliminate them immediately when a sniper scope appears above them. Just tap on a zombie to kill it. You will also be rewarded with sources, which could be anything from gas cans to food or even XP. You may receive radio phones as loot after completing a level. The radio phone can then be used to bring more survivors to your camp. You can then add them to your team and take them to battle. However, not all of them can be taken to battle because of lack of space. Thankfully, you can retire the ones you don’t need. 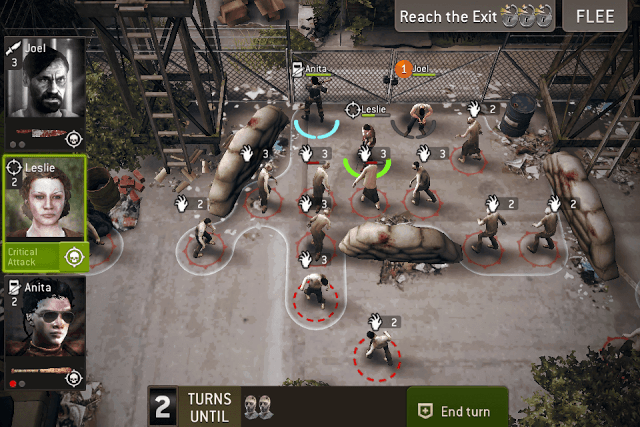 Retire “common” survivors once you have a strong team consisting on uncommon or rare team members. You will earn extra XP if you retire unwanted survivors. Make sure you have at least two farm plots. Farms produce food, which is required to upgrade all structures. Keep on upgrading farms at regular intervals (Notice the green arrow. It shows that a structure is ready for upgrade) to increase their production per hour and capacity. The more food you have, the faster will be structure upgrades. Build and keep upgrading Supplies Storage to increase food storage capacity. As you progress, you will need more food to build new structures and upgrade existing ones. Upgrade the Hospital to decrease healing time and increase healing slots. Upgrading your hospital to level 3 will help you concurrently health two survivors at the same time and upgrading it to level 6 will let you heal 3 survivors at the same time. Keep in mind that the survivors on the left will be healed first. Upgrade the Mission Car to increase gas storage capacity. The more gas you have the more missions you can play. Increasing capacity will give you more gas cans once the refill time is over. Upgrade tents to increase XP production rate and max capacity. You will need XP to train your survivors and level-up their weapons/armor. A badly injured survivor ends up in a struggle with his attacker, but does not die. Make sure you send one of your team members to kill the attacker. If you are too late in rescuing your struggling team member, the game ends abruptly and you will be taken back to your camp. The injured team member is then taken to a hospital and you will have to wait minutes before it heals completely. Don’t use melee class survivors against a heavy walker. It can stun them with its attacks. Try using a ranged class to eliminate from a distance. Upgrade a survivor’s weapons/armor. Upgrading weapons also unlocks special traits that may deal more damage to zombies. You may have to train a survivor to a particular level before you can upgrade his weapon. Special traits also get unlocked after training uncommon survivors. Level them up using XP and make them more powerful. Have at least 2 farm plots to earn more food. Food is required to upgrade structures and the Council, which frees up space, unlocks more land and new structures. The Bruiser class survivor stuns an enemy instead of killing it. It may take two attacks from a bruiser class to eliminate a zombie. While this may be a drawback if there are several walkers surrounding your team, it won’t be easy for them to injure a bruiser class survivor as his health stats are usually higher than other classes. 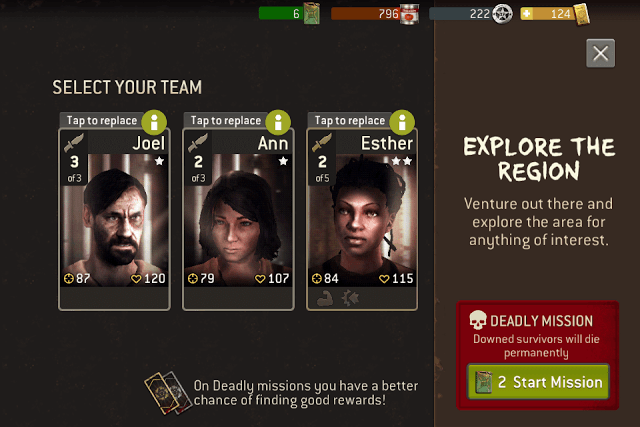 Each stage of a mission has a survivor level recommendation, but you can win it if you chalk a good strategy and have the right mix of survivors. Make sure you have more trained uncommon survivors in your team and make the most of the environment and obstacles to avoid direct confrontation with tougher enemies. In missions labeled “Deadly”, badly injured survivors will die permanently. Once dead, you won’t be able to recover them. To avoid perma-death, take the best survivors with you. Make sure you train survivors/upgrade weapons and add different classes to your team. Avoid hard-to-beat zombies and look for the exit after completing the primary mission. Are deadly missions ever compulsory? Like, when I get to higher levels will I be forced to do deadly missions in order to gain rewards? Developers have removed deadly missions. There are only regular missions now.